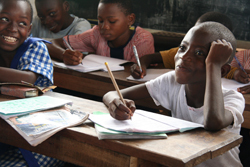 Despite an overwhelming need for access to education, enrolment at the Hands at Work community school in Lagos, Nigeria has been halted since October 2008 due to overcrowding. The 182 primary school students overflowed the tiny wooden structure used as a school. After a long search, the local home based care volunteers discovered land and negotiated an affordable deal to construct a new school, which will open in June 2009, enabling more vulnerable children to receive schooling.